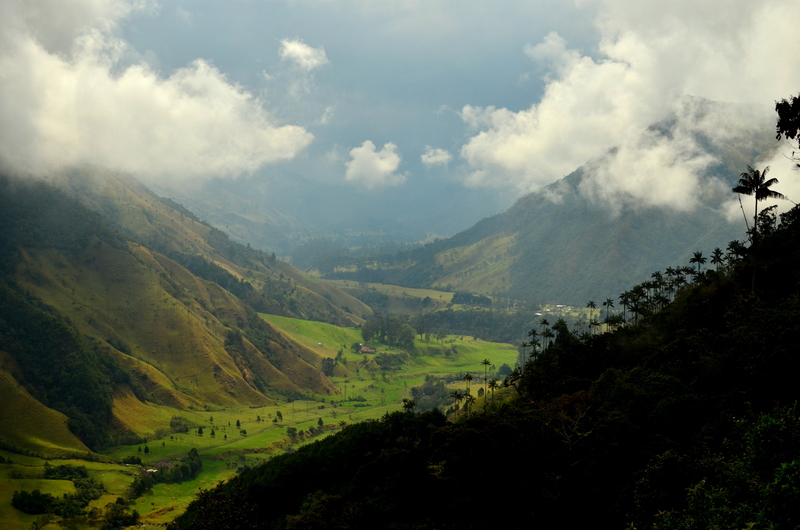 For this week’s photo challenge of green I chose to highlight a photo from the Valle de Cocora in Salento, Colombia. Salento is a quiet little town during the week that turns into a bustling, bursting at the seams pueblo each weekend. Just a short ride in the back of an old Willy Jeep dropped us off at the start of the trek. Steeply sloped mountains smoothed out to a lush, verdant stretch of a naturally perfect valley withing cows grazing in the pastures surrounding us. Thick forests were cut by deliciously crisp streams with rickety swing bridges providing the passageways across. Shortly after getting into the thick of the forest it began to rain hard. Visibility was lost for the next hour or so as we ascended into a cloud forest that was home to massive pine trees. At this point it looked like we were not going to have decent conditions to see the highlight of the walk, the valley filled with gigantic wax palms that stretch up to 180 feet in the sky. At the top of the forest we paused and watched as the clouds were swept away by the mountain winds. As we began descending down into the valley we were greeted with a view that stunned all of us. The green of the valley was more beautiful than I could have imagined, highlighted by the afternoon sun. Oh the memories!… It’s Rebecca and Bob from Kentucky. Just wanted to say hello and see where you guys are currently traveling. Hope you are both doing well! Sweet, sweet Salento, oh how I miss thee. It’s great to hear from you two! How’s life back in the states? Did you two end up in New Orleans? If you want to know what we are up to this blog will take about 3 months to get there. Next up is Panama, and that was before we even met you two. Right now we are in Lima waiting for a friend to tag along for about a month. Hopefully we’ll dodge some of the rainy weather when we get up to Huaraz. Oh, and we found a cheap way to go to Macchu Picchu, so we will be all over that sometime soon. Eat a lot of sushi in lima. We loved it there! We are in Kentucky working to save up some money for our next step, which is a toss up between new Orleans and working on a farm right now. We’re in total culture shock, but working our way through. Enjoy Peru and we’ll keep following the super outdated blog reports! Ha. Your photos are great! wonderful landscapes! I ffor all time emailed this weblog post page tto all my associates, as if like to read it after that mmy friends will too. I don’t even know the way I ended up here, however I thought this publish was good. I don’t knoow who you are however certainly you are going to a well-known blogger should youu are not already.